To think that this is the second Legendary Pokemon…well, I suppose “Legendary level” Pokemon, to have an evolutionary line up for it. First we had Cosmog and Cosmoem into Solgaleo and Lunala, now we’ve got Poipole into…a purple bat-bee thing. Huh. Naganadel-GX is a Stage 1 Psychic Ultra Beast, 210 HP, with a Psychic Weakness, no Resistance, and a Retreat Cost of 1. Its first attack, Beast Raid, costs 1 Energy, and it deals 20 damage for every Ultra Beast you’ve got in play. Jet Needle then is a 3-for-110 move that’s unaffected by Weakness or Resistance…neat. And then Stinger GX costs 3 Energy of any kind, and it has a…unique effect on Prize cards. 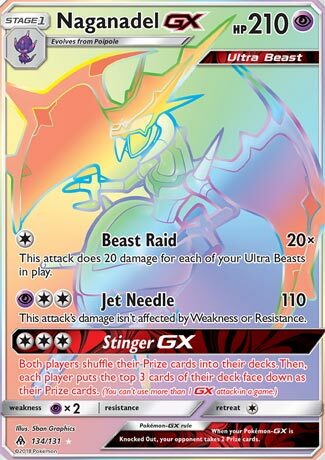 I have to say that, out of all the Ultra Beast cards, this one is the most flexible, given that most of its Energy requirements are fairly loose, with the exception of Jet Needle needing a Psychic Energy in order to get going, but if you’re playing a dedicated Ultra Beast build, chances are you’re not running Jet Needle. In fact, you’re more likely powering up Beast Raid by throwing a few on the Bench, with some of the best ones being Dawn Wings Necrozma-GX, Buzzwole-GX or Dusk Mane Necrozma-GX for raw power, Nihilego-GX for the Ability, and things like Pheromosa (the non-GX) for cleaning up. I say these are the best ones just in terms of splashable potential, because there’s no way you’ve running every single possible Ultra Beast all in one deck consistently. Now Beast Raid aside, Naganadel-GX does have one major curious trick up his sleeve – that being the Stinger GX move. Once per game, you’re allowed to use this move to shuffle back all the Prize cards left in play for both players into their respective decks, then take the top 3 cards off of each deck as new Prize cards. This can either be used early on to make the game go by really fast, or it can be used later on to help save you an extra KO to come back. It’s an odd thing to see a GX move that doesn’t necessarily have to be used early on or during the late-game, because it has utility in both of these areas rather than in exclusively one or the other. You could even use it to get back a card you know to be in your Prizes thanks to searching! So combined with one of the most flexible GX moves to date, and a cheap move that can hit high, it seems like Naganadel-GX is bred for success. Whether or not the Ultra Beast deck archetype will see the same success, well, that remains to be seen. But Naganadel does counteract itself and Buzzwole-GX…though Jet Stinger will be useless in that match-up. Arora Notealus: Naganadel might be one of the stranger ideas for Ultra Beasts, and that’s saying something. Evolving from a poison balloon creature into a bat-bee hybrid? What kind of madness be this? Side Reviews: Lucario – Cynthia decks haven’t really been at the forefront of Lucario-based decks, but considering most of those are centered around the GX incarnation, it’s probably one of the reasons we haven’t seen much of the lowlier version. Might help that it takes less cards to pull off a Lucario-GX maneuver than a successful Cynthia-based Lucario/Garchomp maneuver. Just overall less pieces makes it less complicated to hit big numbers. Palkia-GX – don’t worry, we’ll return to Palkia-GX here later on when we review its reprint complete with Type change. For now though, the original Dragon version hasn’t seen much play, at least competitively. I do think there’s potential for the moveset, and maybe if Gardevoir-GX isn’t such a pest around the area or if there’s a means of accelerating Energy onto it so it can hit hard and fast as Buzzwole-GX or Zoroark-GX, it might stand a reasonable chance. Next Time: Out of the shadows rises another! Our fifth best is another ultra beast in this countdown: Naganadel GX! While other ultra beasts are basic Pokemon, Naganadel GX is actually a Stage 1 because it evolves from Poipole. A Psychic type with 210 HP, weak to Psychic, and a retreat cost of one, it has 3 attacks. Beast Raid costs C and does 20 damage times for each Ultra Beast you have in play. Jet needle costs PCC for 110, and this attack’s damage isn’t affected by weakness or resistance. And Stinger GX costs CCC and both players shuffle their Prize cards into their decks. Then, each player puts the top 3 cards of their deck face down as their Prize cards. There are a handful of GX and non-GX versions of Ultra Beasts, but not enough to consider dedicating an entire deck solely of Ultra Beasts save for a few examples. Some partners that I can think of may include Kartana-GX for it’s ability to discard Special Energy (then it just sits there or sometimes use a GX attack to steal a prize card). Buzzwole-GX is another good partner for good damage for one Energy. Dawn Wings Necrozma-GX and Float Stone enables mobility and helps you save energy cards attached to your Pokemon. So looks like there’s enough material to work with. Stinger GX is an interesting GX attack due to being very good early and late game. You can use that to put your prize count from six to three prizes. If your opponent is about to win and is down to one prize remaining, you use that gx attack to bring it up from one to three. Jet Needle won’t do any favors when it comes to dealing significant damage due to not applying Weakness and still falls short of 2HKOs without help. Naganadel GX (FLI 56) makes its debut in the Pokemon TCG in the Forbidden Light expansion set. This 210 HP Stage 1 Psychic Pokemon is the first non Basic Ultra Beast introduced in the meta. It has three attacks, only one of which you’ll probably ever use. Beast Raid, for a single Colorless Energy, does twenty damage times the number of Ultra Beasts you have in play. In ten matches, I never once used Jet Needle or Stinger GX. I have also faced Naganadel GX when playing Zoroark GX and Zoroark Break, and I had the opportunity to steal Stinger GX multiple times and chose not to. Obviously, if you’re down something like four prize cards to two or one for your opponent, you’ll want to try to use Stinger GX. The problem with Stinger GX is that your opponent always goes next and has the initiative and advantage in tempo. Also, the decklist I played was built around single attachment attacks. Moreover, if I were going to put three Psychic Energy on a Pokemon for the express purpose of using its GX attack, I’m probably putting those energy on Dawn Wings Necrozma GX and not Naggie. Honestly, I never put more than one energy on Naganadel because I was always ready to use Max Potion, Super Scoop Up, or Acerola and erase the damage my opponent just did to me. It’s a fun deck to play, as I said, very much built around hitting your opponent for 120 (maybe even 150 or 160 if you can get Beast Energy and poison your opponent with Nihilego’s Empty Light ability). Really, if you can drop a Nihilego, Invade with Dawn Wings and then retreat back into Naganadel, this is like using Espeon GX’s Psybeam attack … only for a boatload more damage. Most games I didn’t use Kartana, but when you do run across a deck with SPE, Kartana sees plenty of action. Otherwise, however, it’s not a completely worthless card: Kartana is GREAT Ultra Recon Squad fuel. And URS is a fantastic Supporter in this deck. To be able to draw six cards without discarding or reshuffling is a huge advantage. It’s also a disadvantage if you get it early because you want to get Basics on the bench to power up Beast Raid. So there’s a little bit of counter-synergy there in the early game, but once you get that bench filled up, Ultra Recon Squad can be a very good engine for this archetype. I wasn’t tracking every card I played in this deck, so I can’t objectively tell you what cards I played more than others. I might drop the Metal energy and even the Unit Energy, but I did use Kartana’s GX attack a couple of times. I might cut the Nest Balls too. I might add a Brigette or two, but I’m definitely not adding Lele or Oranguru or Octillery. Only Ultra Beasts in this decklist. This archetype is not perfect, however. Going with the THKO strategy means you have to do triple digit damage every turn. It’s hard to do that if you’ve been Parallel Citied or get off to a slow start. The biggest problem for this deck, though, is its Psychic weakness. I’ve said for a while that Psychic weakness is the worst weakness in the game right now. There are so many cards that abuse their Psychic type advantage, from Dawn Wings Necrozma GX, Mew FAC, XY Promo Mewtwo EX, Evolutions Mewtwo, Silvally GX and its Psychic Memory Tool, there are so many Pokemon to tech into decks to counter Pokemon with Psychic weakness. If you’re building a deck around a Psychic weak Pokemon, just realize there are going to be games that you will lose before the starting Pokemon are flipped over. That’s why I’m not all in convinced that Buzzwole GX is going to rule the format. It’s definitely better, but that weakness mechanic is so dominating. Obviously, we are in the thick of the Ultra Beast era, so there are more Ultra Beasts to come to add more flavors to this Beast Box archetype. I’d guess that a draw support Ultra Beast will come eventually, and maybe even more Ultra Beasts with other cool abilities to make this deck even better. Our fifth place finisher is Naganadel-GX (SM – Forbidden Light 56/131, 121/131, 134/141). It appeared on all five individual lists, earning a total 93 voting points, seven more than last Friday’s 6th place pick but only three points shy of tying tomorrow’s 4th place pick. In other words, we’re getting to the place where all the cards might be pretty close in overall quality. If the reviewer who ranked Naganadel-GX as his 14th place pick – that would be me – swapped it with his 10th place pick – a card we haven’t reviewed yet – then Naganadel-GX would have finished 4th! So why did everyone else rank Naganadel-GX higher than I did? Why did I still rank it well above most of the rest of the set? This is a 210 HP Stage 1 Pokémon-GX; while you have to deal with the usual Pokémon-GX drawbacks, you just clear the threshold that makes you an unlikely OHKO. You’re well within 2HKO range, but that means Naganadel-GX is likely to swing twice… unless it’s being attacked by another [P] Type as it is [P] Weak. While not a huge boon, it is handy that the card has a [C] Retreat Cost, and while barely a drawback at all, it lacks any form of Resistance. Naganadel-GX has three attacks, the first of which is “Beast Raid” for [C] and does 20 damage times the number of Ultra Beasts you have in play. While it requires Benching nothing but Ultra Beasts, a full five-Pokémon Bench would yield 120 damage. A little more reasonable, including just one or two non-Ultra Beasts (so you can make use of stuff like Tapu Lele-GX), still means 80 to 100 damage. If your opponent tries to shrink your Bench, make sure you discard the non-Ultra Beasts; then even your opponent drops a Parallel City and shrinks your Bench down to just three, you’re still doing a decent 60 for [C]. In Expanded, you could try Sky Field so that a crazy eight Ultra Beast Bench allows Beast Raid to swing for 180 damage! Even with stuff like Tapu Lele-GX and other support Pokémon on your Bench, you can probably manage five Ultra Beasts and swing for 120 damage… or perhaps you should go with Dimension Valley instead of Sky Field, so that however much damage you do, you’re using Beast Raid for zero Energy. Its second attack is MUCH less impressive, but not bad; for [PCC] “Jet Needle” does 110 damage while ignoring Weakness and Resistance; the latter is handy, but the former misses a big opportunity. Still, 110 for three is solid. The GX-attack is “Stinger-GX”, which costs [CCC] and forces both players to shuffler their Prizes into their respective decks, then play the top three cards from their decks as their new Prize cards. I’m having a difficult time articulating the intricacies of using this attack. At a glance, it might seem really easy and obvious; use it when your opponent has less than three Prizes and you have more than three! Three Energy and your GX-attack, even when the attack cost is [CCC] can do quite a bit… after all, most decks are going to be throwing at least one non-[C] Energy into the mix so there’s not a huge difference between [PCC] and [CCC]. Even if you pull off some brilliant timing and use Stinger-GX when your opponent is down to a single Prize while you have all six left to claim, you’ve likely only bought yourself a turn or two to “recover”; your opponent just needs to OHKO one 2-Prize target and one 1-Prize target to still win. Better than them only needing 1 single Prize target, but you did not remove any threats from the board with your attack e.g. KO’d whatever is KOing your own Pokémon. Fortunately, this probably isn’t the big use for Stinger-GX. Instead, when you’ve got a great setup and your opponent’s side is lacking, use Stinger-GX to accelerate endgame. When it is the overall third or fourth turn of the game, your opponent’s side of the field is lacking while yours is prepped, you drop both of you down to three Prizes. If they were counting on sacrificing something as a part of setup, relying on a hearty N, etc. your opponent is now in trouble. Putting it all together, and Naganadel-GX looks like a very solid Stage 1 secondary attacker. Yes, it is secondary even if you lead with it; use it to back Buzzwole-GX and/or other Ultra Beasts. In fact, this is probably going to be vital to Beast Box decks trying to utilize all the potent Ultra Beast support, because Naganadel-GX is otherwise low maintenance. Beast Raid and 210 HP are the big selling point (with [P] Typing not much further removed). Stinger-GX shenanigans are a great option but probably shouldn’t be the focus unless you’ve got a clever lock deck to go with it. I expect this to become a common sight in Standard and maybe even Expanded, but always helping out another Ultra Beast (or maybe several other Ultra Beasts). For the Limited Format, if you pull several other Ultra Beasts it can be great, and even if you don’t it will probably be very, very good just due to its size and mostly [C] Energy requirements. Just remember that you start with only four Prizes a piece so Stinger-GX slows things down more than it speeds them up.